A vehicle that’s been constantly fettled and renamed since its launch in 2012, the Jeep Grand Cherokee SRT is in its most powerful guise yet for the 2017 model year. 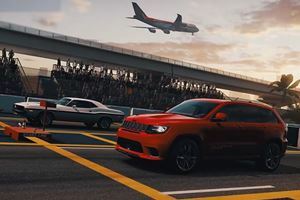 With 475-hp to play with, the SRT’s unsurprisingly a rather quick car, with the fact it’s a Jeep meaning you can also use that power somewhat on rougher terrain. Being cheaper than most of its rivals does result in some concessions in areas like outright ride comfort and interior fit-and-finish, but the rest of the Jeep Grand Cherokee SRT’s package nevertheless has plenty of appeal – even though it’s not quite capable enough to topple the class-leaders. It probably isn’t surprising to hear a Jeep interior isn’t as high-end as, say, an Audi’s or a BMW’s, but it’s an aspect worth highlighting in a car with a $65,000+ base price. That said, the Jeep Grand Cherokee SRT cabin is built with good-grade plastics and leathers. Space, though, is more competitive, with overall head and leg room being on par with most rivals. Likewise, cargo space is on par for the class standard, with the capacities of 36.3 and 68.3 cubic feet with the rear seats fixed in place or folded flat being rather healthy for this niche segment. Plus, the flat load bay and wide aperture means the Jeep Grand Cherokee SRT is quite the handy point-to-point performance load lugger. Whilst never rivalling low-slung sports cars for agility and point-to-point pace, the Jeep Grand Cherokee nevertheless impresses in the handling stakes. Grip from the huge tires is good, as is overall body control under cornering and heavy braking, and the light (if a bit vague) steering makes the car feel more direct than any two-tons-plus vehicle has the right to. At normal speeds, ride quality and noise insulation are as satisfactory as they are on the standard Grand Cherokee. Sadly, the regular car’s limited all-around visibility as a result of a high waistline, chunky pillars and a small rear window have also been ported over to this SRT model. Only the likes of the Range Rover Sport can rival the Jeep Grand Cherokee SRT in this class for off-road ability. Other performance SUVs may have more power, but the Jeep Grand Cherokee SRT isn’t lacking for more oomph. With a 475-hp, 470 lb-ft 6.4-liter eight-cylinder gasoline engine under the hood, buyers can expect 0-60mph times of 4.4 seconds and (where legally possible) top speeds of 160mph. The appropriately throaty exhaust note is rather pleasing to the ear too. All of that aforementioned power is sent to all four wheels via a smooth-shifting, if not entirely responsive, eight-speed transmission. Fuel economy is only 13mpg city and 19mpg highway – though Grand Cherokee SRT buyers should be able to afford the fuel bills. 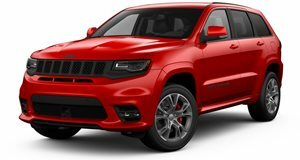 Being the top tier of the Jeep Grand Cherokee range, the Grand Cherokee SRT comes with lots of features to befit the $66,895 base price. All variants get heated and ventilated leather seats, an array of safety assists and one of the best touchscreen infotainment systems in the business, on top of the obligatory performance parts. Buyers after more pace can specify more powerful brakes and lighter alloy wheels (as well as convenience features like a premium audio system) as optional extras. 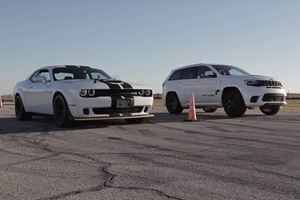 The SRT has yet to be crash tested, but the array of safety equipment as standard and the regular car’s good-if-not-class-leading crash test results should mean the Grand Cherokee SRT will perform favourably in the event of a car crash. Whilst the Jeep Grand Cherokee SRT isn’t admittedly the best overall performance SUV you can buy, it is still well-rounded enough to be an appealing alternative to the more obvious offerings from the premium brands. Do, however, bear in mind there’s an even more potent ‘Trackhawk’ Jeep Grand Cherokee variant in the works. 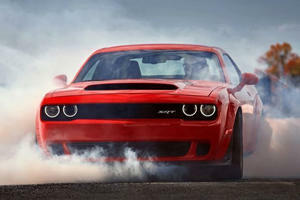 Put it like this: 707 hp behaves better when its sent to all four wheels. Don't worry, the pack also has a few silly cars to putz around in and race cars to trash. There's a logical reason why.